Good morning folks. Feel free to scroll on down with me as I take you behind the scenes on my latest painting. 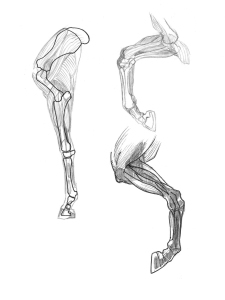 I’ve also included some special treats (anatomy studies and (what?!) transparent paint layers) that I hope to show more of in the future. 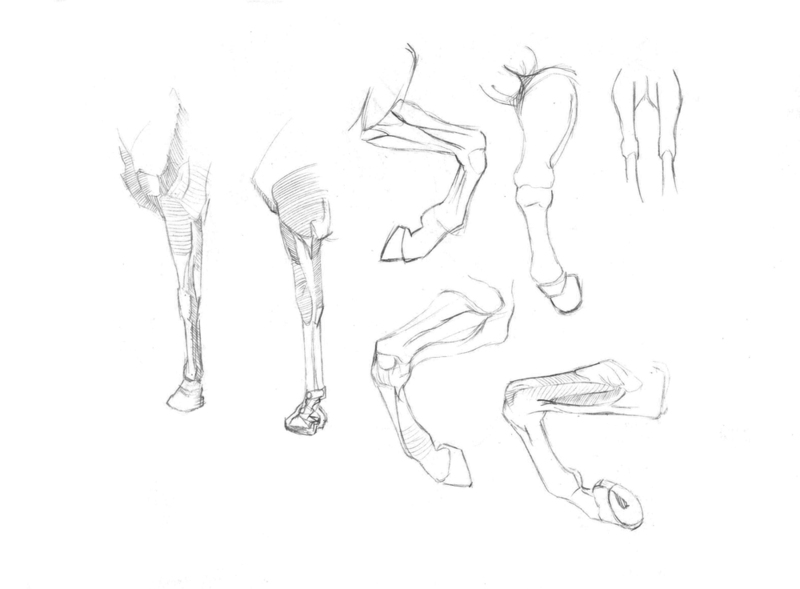 Onward and upward, here are the initial thumbnails. 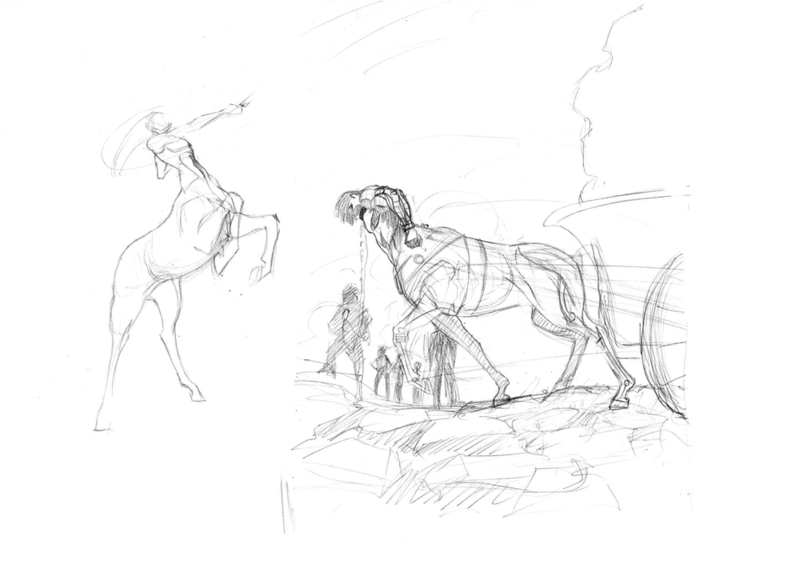 I find it easier to draw the figure in line first and Photoshop quick and large shapes for composition later. Decided to go with the third one. Strong read, simple shapes, interesting potential narrative. 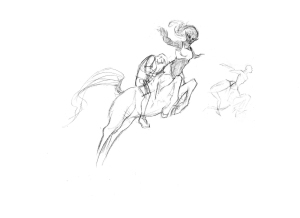 Next up is the detailed sketch, and for that I realized…I sort of know how to draw a human, but I don’t know anything about horses. 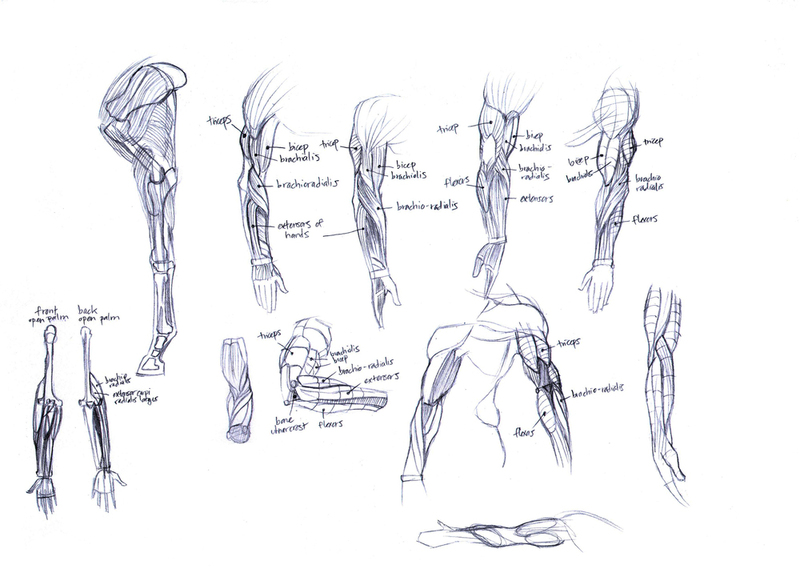 So, I crunched down and drew a lot of anatomy. 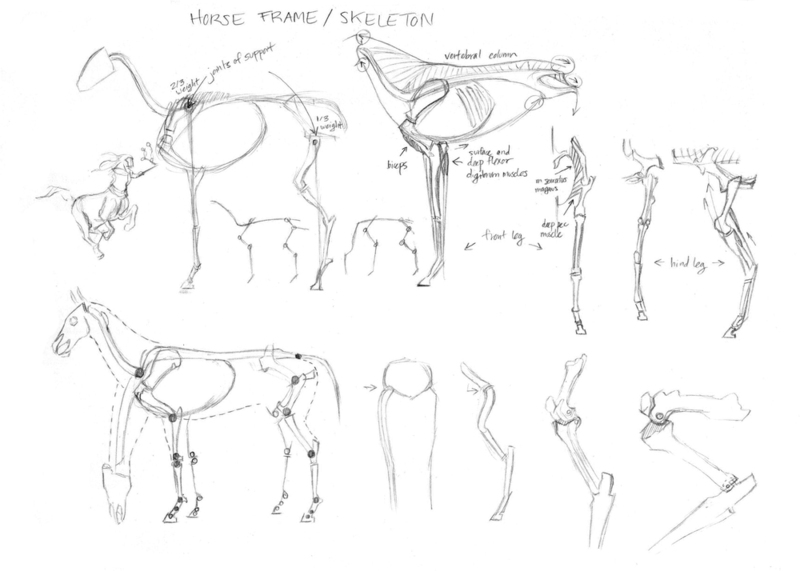 I referenced The Artist’s Guide to Animal Anatomy by Gottfried Bammes as well as The Art of Animal Drawing by Ken Hultgren. After alll that work (which barely scratches the surface), I drew a detailed sketch. The next step is color (shudder). This is where things can get complicated real fast, so I took the sketch into Photoshop for a rough study. Referencing from one of the first illustration masters, N.C. Wyeth, also helps. Onto painting! I started with a pure white gesso board, so thin washes were needed to get rid of the strong background. It’s easier to judge values in the middle area of black and white, pushing and pulling contrasts as necessary. An oil painting works best from thin to thick. Whoop there it is. This piece has a pretty heavy mood as far as the struggle and weight goes. You know how a musician shares a piece of him/herself in the music? How that makes the music more personable, raw, and real to the listener? Same for the visual artist. Transparently speaking, I’m pulling hard against circumstances and mental states that threaten to disarm and destroy me. In fact, it’s not me, but the Creator inside of me that helps pull this off. I’d be in a horrible mess otherwise. Best to you and your endeavors. Keep on keeping on, and here’s to the next piece.